“Black Water” became the Doobie Brothers‘ first-ever No. 1 song when a savvy Virginia disc jockey discovered it after he flipped over one of their singles. WROV-AM was situated near a tributary of the Roanoke River called the Blackwater, and listeners quickly made the song a local anthem. But that was hardly the first – or last – time something like this has occurred. In fact, rock history is dotted with examples of B-sides that became big hits. 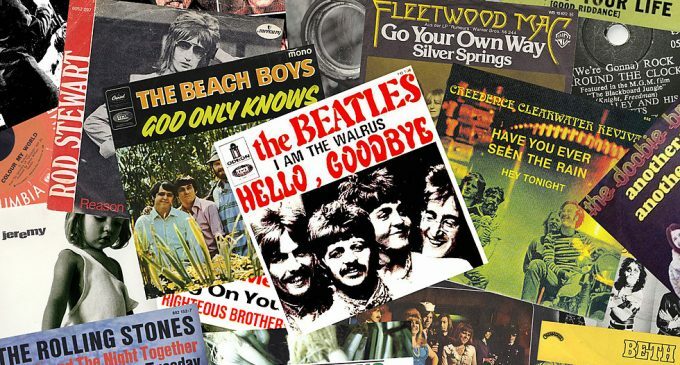 We’re focusing on songs that charted separately, rather than examples like the Beatles‘ “Something” / “Come Together” single, when sales were combined. Sometimes, this A or B decision has been made purposefully: The Rolling Stones and Beach Boys, for instance, issued so-called “double-A” sides that were meant to showcase two worthy songs. Other times, mistakes were simply made: A band, or its record label, wasn’t able to correctly gauge what might hit home with the larger listening audience. And, quite frankly, occasionally things just happen. As with the Doobie Brothers, a connection is made that simply couldn’t have been predicted: That’s how you end up a hit like “Beth,” even though its ballad style had so little in common with Kiss‘ other work. These things haven’t always gone smoothly. In fact, a disagreement over B-side placement for “I Am the Walrus” created some of the first notable fissures on the way to the Beatles’ split. “I got sick and tired of being [bandmate] Paul [McCartney]‘s backup band,” John Lennon later said. Fleetwood Mac ended up returning to an unjustly overlooked B-side decades later. Then there were the tracks that kept getting released until somebody finally noticed them. However they got there, each song on the following list has one thing in common: They’re all B-sides that became big hits. B-side to: “Detroit Rock City” The other members of Kiss didn’t want “Beth” on ‘Destroyer’ and initially buried it on the flip side of the album’s third single in the summer of 1976. Then Rosalie Trombley’s daughter fell in love with this out-of-character ballad. Trombley happened to be the music director at a rock station in Ontario, where she put “Beth” into heavy rotation. It eventually became Kiss’ highest-charting single ever, and the band later reportedly presented Trombley’s daughter with a gold record. B-side to: “Another Park, Another Sunday” This song was a forgotten also-ran when a disc jockey in Roanoke, Va., began playing it in tribute to the nearby Blackwater River. In fact, the Doobie Brothers had already released a follow-up single after “Another Park, Another Sunday” finished at No. 32. Regional interest in its B-side soon went wide, however, and “Black Water” became the first of the band’s two chart-topping singles more than a year after ‘What Were Once Vices Are Now Habits’ was released. B-side to: “Baby, Please Don’t Go” This garage-rock staple was one of the first songs Van Morrison recorded with Them after signing their first recording contract. In the decades since, it’s been covered by Jimi Hendrix, the Doors, David Bowie and a host of bar bands too numerous to count. Yet Decca thought so little of it that “Gloria” was originally relegated to the other side of a single led by Them’s version of “Baby, Please Don’t Go,” a song that’s been covered approximately one million times since it was popularized by Big Joe Williams in the ’30s. B-side to: “Brain Stew” Later re-titled “Good Riddance (Time of Your Life),” this song became an unlikely prom staple for a band known for punky pop, not acoustic nostalgia. Long before reaching No. 2 on the alternative chart in February 1998 – and providing the soundtrack to a series-closing montage on ‘Seinfield’ that May – “Good Riddance” appeared on the other side of the 1996 single “Brain Stew.” Green Day re-recorded it for ‘Nimrod’ the next year. B-side to: “Make Me Smile” Originally found on a single that showcased both the rock and more tender sides of Terry Kath, “Colour My World” quickly became a No. 7-charting slow-dance favorite. But only after it was re-released more than a year later, now with “Beginnings” as the second song. Bill Champlin sang “Colour My World” in concert after Kath’s sudden death; following Champlin’s departure, Robert Lamm and then Lee Loughnane handled the vocals. B-Side to: “Wouldn’t It Be Nice?” God only knows how this wasn’t considered an A-side recording, even if you account for the obvious brilliance of “Wouldn’t It Be Nice.” Maybe the Beach Boys’ label was worried about the title’s seemingly religious connotations for a more conservative American listening audience? After all, “God Only Knows” was the A-side elsewhere. That’s how “Wouldn’t It Be Nice?” became a No. 8 hit on the ‘Billboard’ chart, while “God Only Knows” went to No. 2 in the U.K.
B-side to: “Don’t Be Cruel” As with the Beach Boys’ “Wouldn’t It Be Nice?” / “God Only Knows” single, this isn’t a question of quality. Instead, it’s one of significance. Both ‘Don’t Be Cruel” and “Hound Dog” topped the ‘Billboard’ charts, and not just the pop chart: They went No. 1 on the R&B and country lists, too. But “Hound Dog” had more cultural resonance. It represents one of rock’s earliest broadsides against pop culture, as Elvis Presley made Big Mama Thornton’s earlier single utterly his own. B-Side to: “Hello Goodbye” This continued a string of singles that placed John Lennon’s edgier, often more groundbreaking songs on the other side of mainstream pop ditties by Paul McCartney. It was a practice that went back at least to “Rain,” which appeared on the other side of the Beatles’ “Paperback Writer” single. Same with “Strawberry Fields Forever” (“Penny Lane”), “Revolution” (“Hey Jude”) and “Don’t Let Me Down” (“Get Back”). In this case at least, “I Am the Walrus” was the far better song. B-side to: “Reason to Believe” A cover of Tom Hardin’s “Reason to Believe” made a perfectly serviceable initial single from 1971’s ‘Every Picture Tells a Story.’ But it was quickly put aside when an enterprising disc jockey flipped the 45 over and discovered Rod Stewart’s original “Maggie May.” The A-side ended up halted at No. 62, while “Maggie May” became Stewart’s first solo chart-topper. Going forward, he vowed to trust his own instincts, rather than the record company’s. B-side to: “Thirteen Women (And Only One Man in Town)” One of rock’s seminal moments was initially tucked away on the other side of a single that was generally considered to be a commercial flop. Then “Rock Around the Clock” found its way into the opening credits of the 1955 film ‘Blackboard Jungle,’ and something finally clicked. Bill Haley laid claim to the first-ever rock ‘n’ roll No. 1 song. He subsequently made a cameo appearance in a movie also titled “Rock Around the Clock,” of course. B-side to: “Let’s Spend the Night Together” Radio programmers again seemed reluctant to push the cultural envelope too much, preferring “Ruby Tuesday” to its then-scandalous counterpart “Let’s Spend the Night Together.” As more stations picked up on “Ruby Tuesday,” the A-side quickly faded from the charts. “Let’s Spend the Night Together” – despite being famously censored on ‘The Ed Sullivan Show’ – stalled at No. 55 in the U.S., while “Ruby Tuesday” became the band’s fourth No. 1 song. B-Side to: “Go Your Own Way” Such were Fleetwood Mac’s embarrassment of riches that a terrific Stevie Nicks ballad was bumped off 1977’s ‘Rumours.’ “Silver Springs” eventually ended up on the other side of their “Go Your Own Way” single, but Nicks didn’t give up on the song. When Fleetwood Mac reunited decades later for ‘The Dance,’ she retrieved “Silver Springs” from history’s dustbin. The live remake became a Top 5 adult-contemporary hit, earning the group a Grammy. B-side on: “Penny Lane” As with 1969’s “Something” / “Come Together” single, these two songs were meant to be viewed as a double A-side – but unlike that later 45, this pair of Beatles tracks actually charted separately. 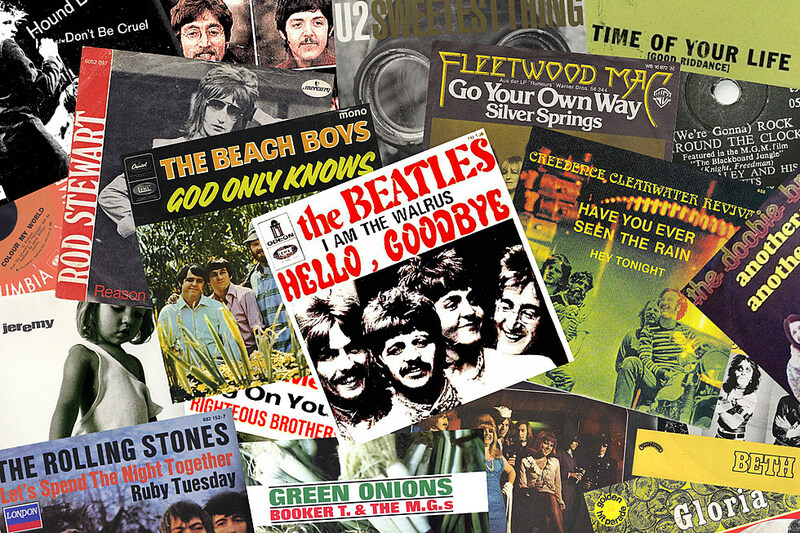 “Penny Lane” topped both the ‘Billboard’ and ‘Cashbox’ charts, while the more experimental “Strawberry Fields Forever” – the first thing recorded during sessions for ‘Sgt. Pepper’s Lonely Hearts Club Band’ – reached No. 8 and 10, respectively. B-side to: “Where the Streets Have No Name” Bono must have gotten in trouble again. The story goes that U2’s frontman originally wrote this B-side as a kind of love note/apology to his wife after arriving late on her birthday. Seems Bono was living out Kiss’ “Beth” scenario in real life while in the midst of recording ‘The Joshua Tree.’ U2 returned to “Sweetest Thing” a little more than a decade later, and the re-recording went to No. 3 in the U.K.
B-side to: “Jeremy” For years, you had to buy the third single from Pearl Jam’s ‘Ten’ to find this fan-favorite outtake. They eventually added it to the 2003 rarities compilation ‘Lost Dogs,’ but by then “Yellow Ledbetter” – reportedly one of the first things Pearl Jam wrote as a band – had become a fixture on their concert set lists as well as a No. 21 hit on the ‘Billboard’ mainstream rock chart. B-side on: “Honky Tonk Women” This track, which actually pre-dated the ‘Let It Bleed’ sessions, took a circuitous route to the American Top 40. “You Can’t Always Get What You Want” originally appeared as the flip side to consensus No. 1 “Honky Tonk Women,” before serving as the closing song on ‘Let It Bleed.’ Then years passed before London Records smartly decided to send it to radio again in 1973. “You Can’t Always Get What You Want” finally hit, reaching No. 34 on the now-defunct ‘Cashbox’ chart.